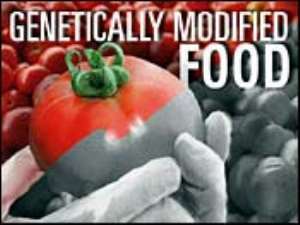 President Kufuor and other West African leaders say they are cautiously in favor of using genetically modified crops. Kufuor says there is urgency to embrace biotechnology because with traditional methods and over-exploitation, fertile African land is being depleted. However, non-governmental organizations are calling for a five-year moratorium so more research can be done. The issue is being discussed at a U.S.-sponsored conference in Burkina Faso. During the three-day conference, which started Monday, West African leaders said they want assurances that genetically modified products are safe for the people who eat or use them, and for the environment. But the leaders say that in general they believe the genetically modified crops will lead to higher agricultural productivity and therefore should be used. Niger's President Mamadou Tandja said he is excited about the prospect of the new crops, but he also wants to make sure Africans get the financial ability and the technical training to use genetically modified production techniques. President Tandja says that in the first tangible impact of the conference, Niger hopes to use biotechnology to resume cotton production, which was abandoned during the 1980s. At the time, Niger faced food shortages and focused instead on food crops. President Tandja says Niger hopes to begin a partnership with Burkina Faso, which has already started the test planting of genetically modified cotton. The host of the conference, Burkina Faso's President Blaise Compaore, said using genetically modified products is like testing new medicines. President Compaore says research needs to be done locally, and that the safety of the new products will always be a concern. But he says Africa can not lag behind the rest of the world and ignore scientific progress. Ghana's President John Kufuor agreed, saying there is urgency to embrace biotechnology because he says with traditional methods and over-exploitation, fertile African land is being depleted. The main conference organizer, Undersecretary of Agriculture J.B. Penn, said the United States will help Africa fight hunger by sharing scientific knowledge and giving scholarships to African researchers. But non-governmental organizations in West Africa remain unconvinced. A group of Ouagadougou-based organizations said they believe the U.S.-based multi-national company Monsanto, which is leading the experiments in Burkina Faso, is simply trying to take over new markets and create dependencies with test products and technology transfers. The groups say food shortages in Africa are caused mainly by poor distribution and lack of infrastructure. They are concerned that once a dependency on genetically modified crops is created, the foreign companies will abandon African farmers, who will not have the necessary know-how and equipment to use the new technology. Benin-based activist Rene Segbenou, who opposes the use of genetically modified crops, warns the introduction of biotechnology could wipe out seed varieties Africans are familiar with, possibly making the food situation worse. "When we talk about the technology, itself, I think that is a way to kill the varieties, the seed varieties, that we always have here on the continent," he said. "The genetic resources of Africa are abundant. We should not let them down to just use something which we cannot use, let us say, with our own capacities on the continent." A protest by non-governmental organization is planned for Wednesday, when the conference ends.